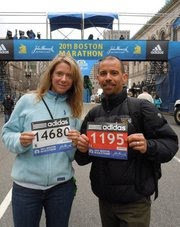 Lloyd and his lovely wife, Andrea-both running Boston!!!! The race weekend did not end until Monday this week. This was the Boston Marathon. “LT” Lloyd Thomas ran another sub-three hour race- 2.56.38 on the Boston Course simply awesome!! !